Quantum physicists have teleported the quantum state of a photon to a crystal over 25 kilometers of optical fiber, smashing the previous record of 6 kilometers. Physicists at the University of Geneva (UNIGE) have succeeded in teleporting the quantum state of a photon to a crystal over 25 kilometers of optical fiber. The experiment, carried out in the laboratory of Professor Nicolas Gisin, constitutes a first, and simply pulverizes the previous record of 6 kilometers achieved ten years ago by the same UNIGE team. 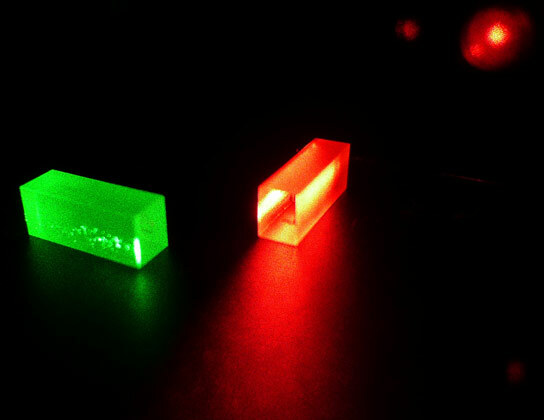 Passing from light into matter, using teleportation of a photon to a crystal, shows that, in quantum physics, it is not the composition of a particle which is important, but rather its state, since this can exist and persist outside such extreme differences as those which distinguish light from matter. The results obtained by Félix Bussières and his colleagues are reported in the latest edition of Nature Photonics. Quantum physics, and with it the UNIGE, is again being talked about around the world with the Marcel Benoist Prize for 2014 being awarded to Professor Nicolas Gisin, and the publication of experiments in Nature Photonics. The latest experiments have enabled verifying that the quantum state of a photon can be maintained whilst transporting it into a crystal without the two coming directly into contact. One needs to imagine the crystal as a memory bank for storing the photon’s information; the latter is transferred over these distances using the teleportation effect. The experiment not only represents a significant technological achievement but also a spectacular advance in the continually surprising possibilities afforded by the quantum dimension. By taking the distance to 25 kilometers of optical fiber, the UNIGE physicists have significantly surpassed their own record of 6 kilometers, the distance achieved during the first long-distance teleportation achieved by Professor Gisin and his team in 2003. So what exactly is this testing of quantum entaglement and its properties? One needs to imagine two entangled photons – in other words two photons inextricably linked at the most infinitesimal level by their joint states. One is propelled along an optical fiber (the 25 kilometers mentioned earlier), but not the other, which is sent to a crystal. It is a bit like a game of billiards, with a third photon hitting the first which obliterates both of them. Scientists measure this collision. But the information contained in the third photon is not destroyed – on the contrary it finds its way to the crystal which also contains the second entangled photon. Thus, as Félix Bussières the lead author of this publication explains, one observes “that the quantum state of the two elements of light, these two entangled photons which are like two Siamese twins, is a channel that empowers the teleportation from light into matter”. From there, it is a small step to conclude that, in quantum physics, the state takes precedence over the ‘vehicle’ – in other words an item’s quantum properties transcend classical physical properties. A step that maybe now one can take. 2 Comments on "UNIGE Physicists Teleport Quantum State of a Photon to a Crystal"
This experiment appears to be of little practical value, since it does not demonstrate true teleportation of information because (a) the first entangled photon is destroyed and (b) the second entangled photon supposedly reflects the state of the third photon – although how this could be known is not explained. It is important that NEITHER of the entangled photons is destroyed, since otherwise quantum communication would be no better than radio or laser communication: you would have to keep generating entangled pairs of photons and sending half of them down fibers, which is actually LESS efficient (and MORE complicated) than normal communication. With communication by true quantum teleportation of information – in theory independent of distance – Alice would remain on Earth while Bob whiled away his time on a spaceship to, say, Jupiter; but any binary code message converted into changes of state (or not) of Alice would be immediately registered by Bob – and vice versa: a real “quantum leap” in the efficiency of interplanetary communication. Would it really be too difficult to try this out with Alice on Earth and Bob conveyed to the ISS? I am also an engineer and you took the words out of my mouth TONY. I believe the writer of this article did not proof read his/her text and referred to the third photon instead of the second, making a bit of a nonsense of his/her explanation. Having said that, I have no idea what “triangulation” means in this context and although I see the connection between billiards and triangulation that is where I lose track. Of course Although I have read a little about quantum mechanics and am aware of effects such as entanglement, it may be that when you get into the intricacies of the topic, every day logic no longer applies in that world.